Tonge of Tonge, Bolton - Timeline : Starting with Gilbert de Tonge in 1212, through to the mid-1300's, including various de Tonge's of Bolton-le-Moors; Glibert, Elias, John, Henry, Ellis, William, Alice and Roger. In 1202 Siward and brother Hugh granted 2 oxgangs of land to Robert son of Ulf. In 1227 Adam de BURGH and Hugh de TONGE each sold their one third share of Duxbury to Siward, who now owned it all. 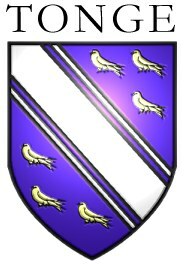 In 1228 Adam de DUXBURY and Hugh de ALDINGTON held land in moiety in Duxbury and Aldington for which they paid a rent of 2s-9d and 14d respectively to William de FERRERS. In 1246 Adam joined with the lords of Standish and Aldington to petition William FERRERS that he should quit them of the services claimed of them by the guardians of the Earl of Lincoln's estates. In 1288 Roger de BOLTON and Ellis de TONGE each bought their one third share back again from Adam de DUXBURY.